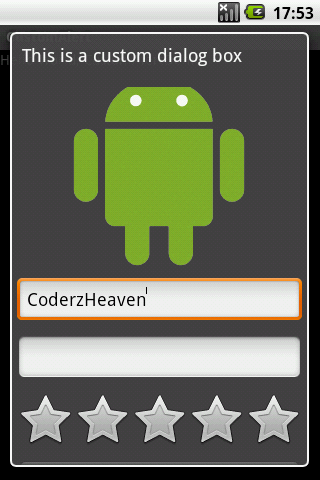 We can create any type of alert in android. Today I will show a simple example showing how to create a custom alert in android. i.e you can provide any layout to your alert dialog. First create an xml for your alert dialog. Here I am creating an xml that contains a textView, an imageView, two editText, a ratingbar and a button. All these are placed inside a scrollview. create a new xml file named “custom_alert.xml” in the res/layout folder and copy this code into it. Now in your main java file copy this code. The showAlert function will create the Dialog with the custom layout and show it. This is the main.xml. Actually we dont need this .